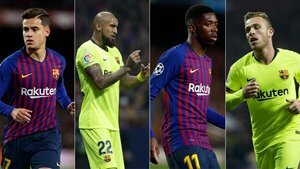 At this point of the season Ernesto Valverde doesn’t have a Gala XI and that is good news for Barca. In recent years they have lacked that internal competition to keep the level high or for players to fill in for injured first teamers. Only Ter Stegen, Pique, Alba, Busquets, Rakitic, Messi and Suarez are untouchables. The other four places are up for grabs. Lenglet is the perfect example. He’s taken advantage of all his minutes and displaced Umtiti from the line up. Nobody doubts that Big Sam will return to his best and the French players will battle it out to pair with Pique. Having Lenglet there will help Umtiti take on every game as if it were his inly chance. There is also good competition between Sergi Roberto and Nelson Semedo. The Catalan has played 2,598 minutes to Semedo’s 2,455, fairly equal. There was the idea that Roberto would play in the big games but that has dissipated with Semedo starting against Man United, at Wembley against Tottenham, at the San Mames, at Mestalla, at the Wanda. Busquets and Rakitic don’t have a fixed partner in the middle. Arthur and Arturo Vidal are vying for the third spot. The Brazilian, however, has come into shaky form just at the moment that the Chilean has found his best. Up front, Neymar continues without a clear replacement. Coutinho took the place, then Dembele won it, then Coutinho came back again thanks to the Frenchman’s injuries. Barcelona finally have a competitive squad, deep and at the right competitive rhythm to take on the decisive phase of the season. Maybe the big names win games but titles are won by having at least 16 or 17 players who are capable of coming in and matching up to the standard against any team.